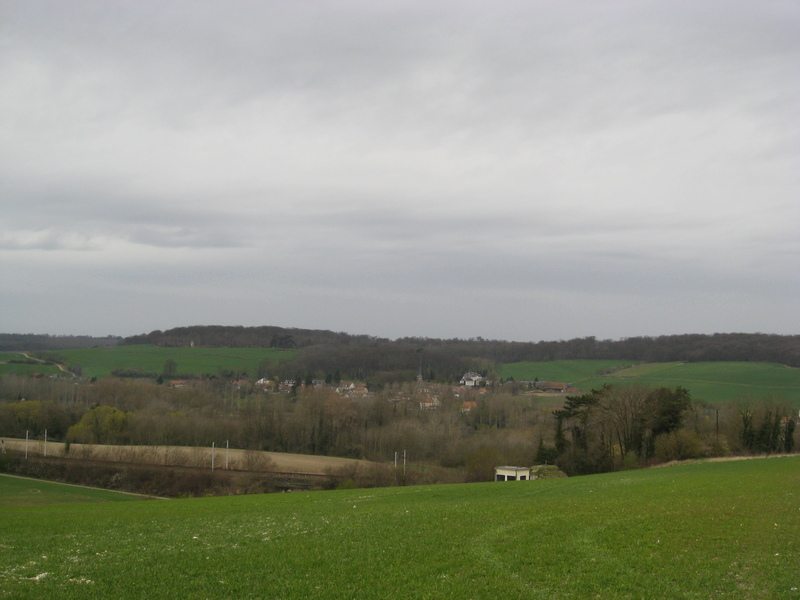 Here is a shot looking eastward over the Avre River valley and the village of Moreuil toward the Wood on the ridge. 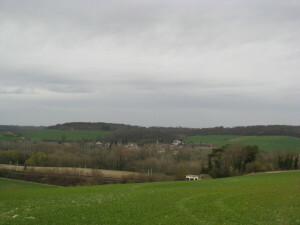 At the left hand edge is the location Brigadier Seely galloped to set up his command for the battle. 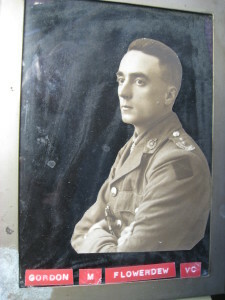 Gordon Flowerdew, VC, who led “C” Squadron of the Strathcona’s and didn’t survive his wounds. March 30th, 2008, at the north-west corner of Moreuil Wood. 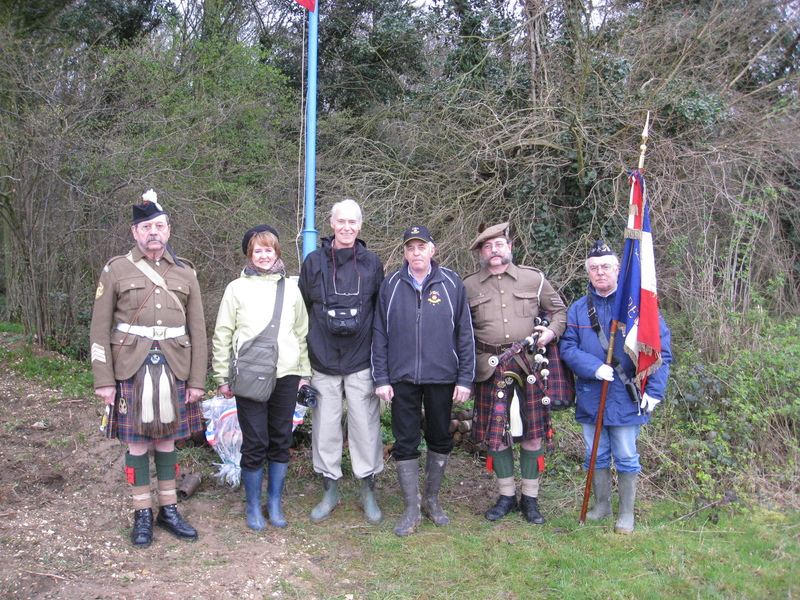 Frenchman Jean-Paul Brunel, centre right, set up a memorial after the remains of a LSH(RC) trooper were found on the site. 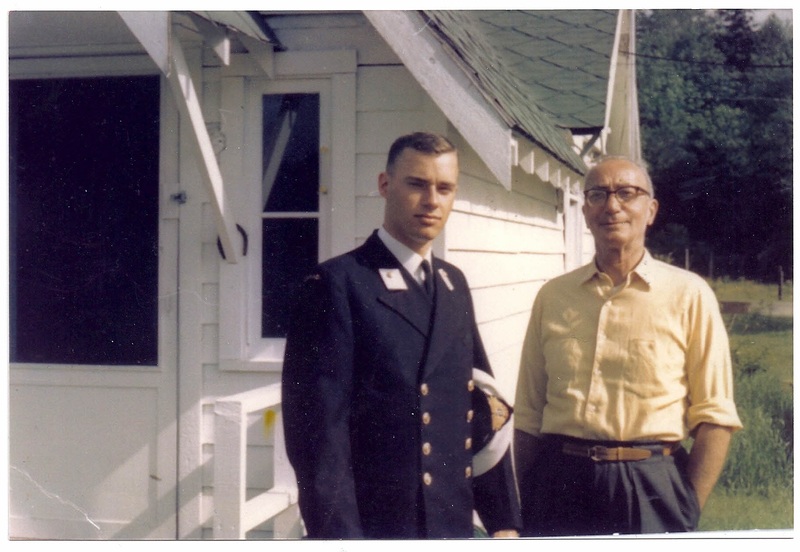 Then-sergeant Tom Mackay, who did survive Moreuil, with the author c 1963. (Note the horseshoe hanging by the door!) I’ll be making an emotional journey to Moreuil at the end of the month. To read Tom’s story, see Soldier of the Horse, available from me or on Amazon or your favourite bookstore. The battle at Moreuil Wood, March 30th 1918, and the subsequent engagement at Rifle Wood two days later, came to define the role played by the Canadian cavalry in the Great War. The preceding months and years in the trenches and out of them, and the cavalry’s role in the Hundred Days that followed Moreuil and Rifle Wood, were brutal and costly. But for sheer bloodiness and loss of life, and as well as for significance to the Allied war effort, those two engagements stand out. Lieutenant S. H. Williams, author of Stand to Your Horses, was there for both battles. He observed that after Rifle Wood the Strathcona’s were down to 98 officers and men, out of their normal complement of 350. Counting the other two regiments, the Dragoons and the Garrys, they mustered fewer than 300 able-bodied men between them. One part of the fight at Moreuil Wood captured the imagination of the public shortly after, and is about to be commemorated on March 30th, this year, its centennial. The charge of Lieutenant Gordon Flowerdew’s “C” Squadron, memorialized in a painting held in Ottawa, will be re-enacted by the Lord Strathcona’s Mounted Troop on that day. It will also be marked by dinners, lunches, and reunions all across Canada and in Europe. Courage shown by those troopers a hundred years ago continues to inspire Canadian troops today.